WASHINGTON (CNS) — Braving near-record low temperatures and Arctic-type wind chills, thousands of young people from across the Archdiocese of Washington and the United States gathered in Washington for a rally and Mass prior to the annual Jan. 22 March for Life. 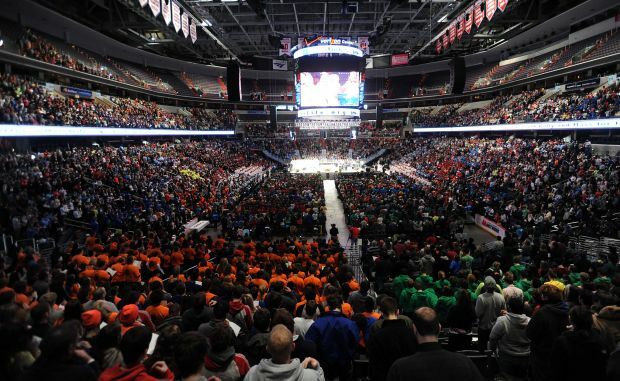 “We can help the world understand that no one is an accident, all have a purpose and are loved because each person has the face of Jesus Christ,” Father Michael Paris, a parochial vicar at St. Patrick Parish in Rockville, Md., told more than 10,000 youth who gathered for the Archdiocese of Washington’s Youth Rally and Mass for Life at the Verizon Center in downtown Washington. The priest was the homilist at the Mass, which was celebrated by Cardinal Donald W. Wuerl of Washington. Concelebrants included several bishops, including Washington Auxiliary Bishop Martin D. Holley, and more than 160 priests. The Mass and Rally for Life is traditionally held on the morning of the annual March for Life, which this year marks the 41st anniversary of the Supreme Court’s 1973 Roe v. Wade decision that legalized abortion on demand in the United States. The same day the archdiocese also sponsored an additional Youth Rally and Mass for Life that drew thousands of mostly out-of-town marchers to the Stadium Armory in Washington. Washington Auxiliary Bishop Barry C. Knestout was the main celebrant of that Mass. Among the “voices of life” at the rally and Mass was William Bolin, a member of St. Andrew Apostle Parish in Silver Spring, Md. He said the frigid temperatures would not deter young people who defend life. The inclement weather did not keep a group of young pro-lifers from St. Martin of Tours Parish in Gaithersburg, Md., from attending the event. Father Paris told youth not to be discouraged in sharing the pro-life message with others. Also during the Mass, Archbishop Carlo Maria Vigano, apostolic nuncio to the United States, read a message of support to the pro-lifers from Pope Francis. He said the pope was “most grateful to all those who take part in this outstanding public witness to the right to life.” Participants at the Verizon Center rally offered Pope Francis a thunderous standing ovation. Father William Byrne, pastor of St. Peter Parish on Capitol Hill and the Archdiocese of Washington’ secretary for pastoral ministry and social concerns, opened the rally with a prayer. Young people in attendance said they were committed to seeing an end to abortion. “I am motivated to see this terrible thing called abortion stopped,” said Kaycie Willard, a junior at Bishop McNamara High School in Forestville, Md., and a member of St. Joseph Parish in Beltsville, Md. Susan Lea, a member of St. Francis of Assisi Parish in Derwood, Md., said that young people have an important role to play in defending life. More than 400 people from the Diocese of Wichita, Kan., made a 24-hour bus journey through snow and ice to attend the youth rally, Mass and March for Life. Cleopatre Thelus and Amande Cholodewitsch, college students from Cleveland, traveled to Washington by themselves. “I just wanted to be with my fellow Catholics and stand for life,” Thelus said. Cholodewitsch noted that this was her fourth year attending the rally and Mass. Szczepanowski is a staff writer at the Catholic Standard, newspaper of the Washington Archdiocese.